Today the U.S. Dairy Export Council officially launched an entirely redesigned website offering USDEC members and the broader U.S. dairy industry interactive market data, more accessible research and the new U.S. Dairy Exporter Blog. 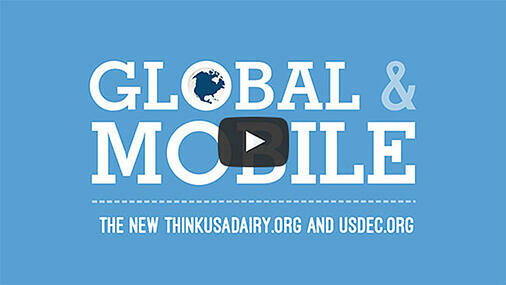 The redesigned usdec.org was unveiled to the news media simultaneously with a new customer-oriented website, ThinkUSAdairy.org, created for the unique needs of global buyers, foodservice professionals as well as food and beverage manufacturers. A short video explains the strategy and tools of the new sites. Interactive charts, enabling members to drill deep into trade and market data and download the results for presentations. Faster and more visual access to a growing library of USDEC research reports that provide actionable insights for business decisions. “The U.S. Dairy Exporter blog,” dispensing market analysis, research and news at the speed of global business. Subscribe to get updates in your inbox. Members-only access to biographies of USDEC staffers. Each bio presents the staffer’s photo and specific area of expertise. This will provide faster, more efficient service when members need to find assistance from just the right person. Twenty years ago, USDEC began working with processors and exporters through funding from Dairy Management Inc. and the farmer checkoff program, with additional assistance from the U.S. Department of Agriculture. The nonprofit organization’s mission was to enhance global demand for U.S. dairy products and ingredients. Exports then accounted for less than $1 billion in sales, half of which were government subsidized. In 2014, sales topped $7 billion, a fifth consecutive record year. Today, milk from 1 in 7 trucks leaving American dairy farms ends up in products and ingredients sold overseas, making exports a vital growth path. After extensive research of its U.S. members and global customers, USDEC decided the distinctive needs of these two audiences merited separate but connected sites, designed with a similar look and feel. Both sites are built to provide fast, practical and user-friendly business information. With mobile usage rapidly expanding in key U.S. markets such as Mexico, China, Korea, the Middle East and Southeast Asia, the websites seamlessly adapt to any device, whether a personal computer, tablet or smartphone. Mark O'Keefe, vice president of editorial services, will serve as editor of usdec.org as well as this blog. The launch marks the first phase of a multi-year digital outreach plan. To further showcase U.S. dairy internationally, microsites are planned for multiple languages, including Spanish, Chinese, Vietnamese and Arabic.